Shh...Don't tell anyone, but writers are sometimes very insecure. There are so many moments in the process of writing and the separate but related process of seeking publication when self-doubt and insecurity may rear their mercilessly cruel heads. Sometimes, that self-doubt is warranted...it can drive us to improve and evolve. But sometimes it can be crippling. SO...it seems important to celebrate milestones...if only for a moment. And so here's yet another *Big Moment* as we get closer to the May 2nd release date for Never Too Late. 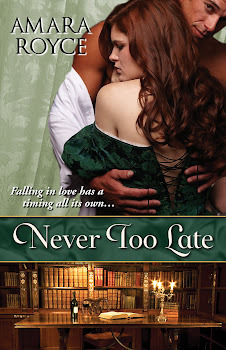 Never Too Late has received advance praise from USA Today Bestselling Author Nicola Cornick, a brilliant powerhouse in Regency historical romance. I adore her Scandalous Women of the Ton series, especially Desired. "Deliciously romantic and sizzling with sensual tension." "A strong heroine, a gorgeous hero and an intense and passionate romance. Captivating!" **I was doing so well controlling the exclamation points, but they burst out anyway. How could they not, after such wonderful words?! So giddy! I may print out her comments and put them in a frame by my desk as a talisman to use against my next onslaught of writerly self-doubt. Lara - Thanks! At this point, I think exclamation is beyond my control. They're just going to happen. I hope things are going well in your corner of the world too! !